I figured the flashlights seen in the trailers so far, were found items. Excellent research!...but stop me if I'm wrong but it seems that on the last pic with David the outside rim on the lamp part is grooved, while on the product pic it's not. Good point and I don't have an answer to that. Mine (which I got from Dealextreme) has a screw-off rim at the end, and in my pics it's removed. If there is another version of this, or a flashlight that this is a knockoff of, I'm not aware of it. Perhaps the prop flashlights in the film have got a different rim screwed onto the end. it seems if you take off that petaled end rim... the lens will fall out! So either they ground down the rim, or replaced it with a different part... something to keep the lens from falling out. Thinking outside the box a little here, but are we sure there are actually lenses present in the movie stills? Good point Brownclaw...difficult to see from the screen grabs, but I don't see why they would remove the lenses I know that pieces of glass/plastic can reflect lights/crew and such, but since those are lit it has no more importance in terms of "reflection" problems. But i think its a MTE SSC-P7-D in silver. That's certainly a good match, Gero! I emailed the company to see if I can buy just one of the bezel rings... let's see if they reply. Great work guys, thanks for sharing !!! At the left lamp you can see the reefs (i hope the translation is correct). So one question is, did MTE make a silver version of the SSC P7. Or did the production just buy black flashlights and paint them (which admittedly would get rid of the logos on the sides as well...). And the other question is, did MTE manufacture and sell these under the UltraFire name also, or is UltraFire a copy by a different company (the two brands seem to sell for about the same price though, so there's not a lot of money to be saved by getting the copy if that's indeed what it is). MTE is a company based in Singapore, Ultrafire is a company based in Hong Kong. Who is here copied from whom is the question. Both are, however, own manufacturer. MTE provides on request, in any color you can anodize. The number is crucial. In the German Torch-Forum the MTE torches is always referred to as the original. This is probably because the MTE models appear before the ultra-Fire. The guys in the forum are just as crazy in Flashlights as we are in Blade Runner. And they are just as competent. So I think that MTE is probably the original. Excellent Gero Karl: probable they've been painted as to not show the logo as you said...or take a silver flash light and just replace the ring with a dented one (less to paint). I agree with Gero's reasoning, probably the movie flashlights are MTEs. And I'm guessing they are painted... hard to be 100% certain but it looks to me in that shot of David grinning at the little dancing things (which is freaking me out btw) it does look like there are some dark spots on the flashlight, where perhaps the silver paint is rubbed off. 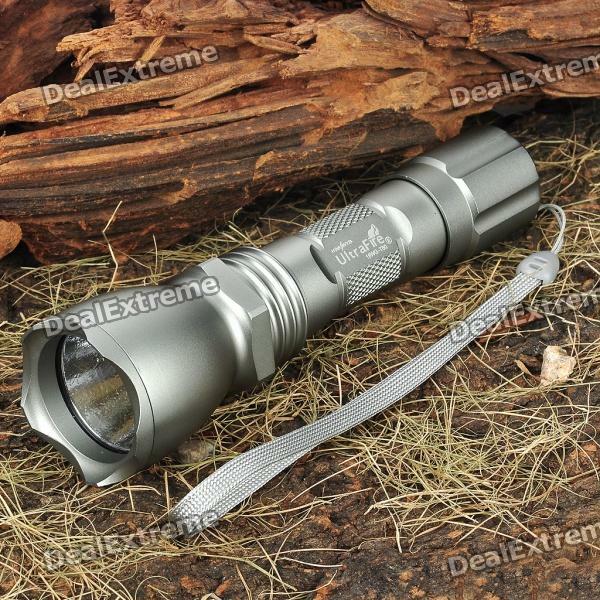 I got a response from MTE, they wanted me to send photos of my flashlight so they can be sure to give me the right bezel... hopefully they will not be upset that my flash is an Ultrafire and not MTE. ... hopefully they will not be upset that my flash is an Ultrafire and not MTE. So I heard back from MTE, they say they could send me just the bezel ring, but "maybe the freight is too expensive" and would I be interested in buying a flashlight.